What makes the HORTILUX Super HPS the best high pressure sodium light? Unlike traditional HPS lamps that are just used for flowering and fruit production, HORTILUX HPS lamps are designed to produce enough, violet, blue, and green light to be used as a light source throughout all stages of plant growth. That's the benefit of having an HPS grow light with the exclusive HORTILUX spectrum. Our spectrum promotes bigger, fuller growth in plants and helps make the HORTILUX Super HPS the best in the market. 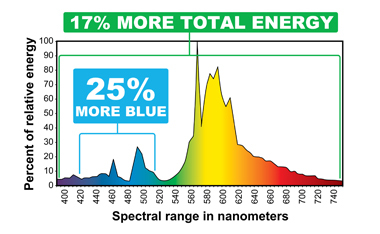 Our Super HPS light provides 25% and 17% more spectral energy more light energy than competitors. The quality of the Super HPS spectrum allows growers to produce high, consistent yields through many growth cycles. The cheaper brands only produce on good yield through one cycle. This saves you time and money. Why choose a weaker grow light when you can use HORTILUX Super HPS? mage of the HORTILUX Super HPS grow light spectrum. When you buy HORTILUX grow lights, you get quality. Our Super HPS lamps are made in the U.S., are individually tested before they get shipped out of our facility, and feature a one-year warranty. Super HPS is also compatible with electronic ballasts. Even more, our lamps feature an environmentally-friendly design and are rated as non-hazardous by the Environmental Protection Agency.